A wise man once said, "Feedback is a gift." Truer words could not have been spoken. Like any gift, though, it can come in many shapes, sizes and presentations. Sometimes it comes as enthusiastic praise that gives you a good feeling and motivates you to do more of the same. Other times, it comes as a stern dressing down, complete with finger wagging, sharpened tone and barely contained contempt. Is the latter less desirable? Not at all. Feedback in the form of customer complaints is the purest of the pure. It's in your best interest, then, to learn how to dissect the criticism you might receive to improve how you do business. Take a deep breath, relax and discover how customer complaints can be really good for your business. 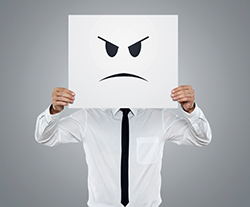 Customers launch into complaint mode at different times and in different ways. Some speak up right away. Others hold their tongue, hoping somebody "in charge" notices their dissatisfaction. Still, others will go into a tirade (hopefully not too often) when they simply can't take it anymore—and someone's going to hear about it. No matter when a customer is ready to complain and no matter how he lets you know he's unhappy, have your listening ears on. As he tells you his reason(s) for complaining, listen for a few key things, beginning with tone and temperament. This will clue you in to how long your customer's been dissatisfied, if he's been dissatisfied with you or your product before, and if he feels he'll get proper attention and response to his problem. Secondly, listen for the customer's willingness to let you resolve the matter. This is an important indicator that tells you his interest in your product, service and business method. If this is a repeat customer, this indicates he's been satisfied before but this time something's not quite to his liking. With first-time customers, their willingness is a sign you offer something desirable or otherwise useful. They want to buy what you're selling. If they're not willing to peacefully resolve the matter, then something has gone seriously wrong. Don't fold up, but, rather, open up. The best way to understand a customer's complaint is to get him to talk about it. While some customers will make efforts to reach out to you to voice their complaints, many simply won't bother. Those customers have the feedback you can truly profit from because they're the ones who will quietly abandon you and your business—and you need to find out why. Whether they're the type to speak up or just silently slip away, give all of your customers the opportunity to tell you about your business from their perspective. These days, the best method to encourage and collect customer feedback is via a toll-free phone number. That lets them reach out immediately to tell you what's on their mind, what they're having trouble with and what they want. Staff that phone—think of it as the flashing red Bat phone—and be sure a live person will answer when they call. Social media is another venue where customers can interact with you and get fast responses to their inquiries. For some customers, this is actually the preferable method since some are more comfortable with chat messages than face-to-face conversation. Offer both methods, if you can. This way, you can satisfy the needs of all customers. The more ways your customers have to get in touch with you, the more opportunities you have to discover what issues they might be having and what you might do to improve their experiences. Why is customer feedback—especially the complaints—such a gift? Because these rants are the spontaneous and unfiltered reactions customers are having while doing business with you. That feedback tells you what is working and what isn't. Now, not all customers will react the same way to the same path of experience, but then it's not wise to ever disregard any customer who has taken issue with your business. Most important about customer complaints: If there are several that center on a particular area of you business, you have a trend—in this situation, likely not a good one. This could point to a process or product that isn't up to par. If left unchecked, it could cost you customers in the future (and might have cost you those who quietly left already). Take the complaints, then, to refine your business. Adjust your policies, your product lineup and whatever else customers call you out on. The worst thing you could do is nothing; that screams that you're not interested in listening to you customers at all. Word of that will travel fast—you can count on it. So open up those channels of communication, invite feedback from your customers, and show them you're here to listen and serve. And if you've clearly established that as your way of doing business, the next feedback you receive will likely be glowing.